As layer upon layer of asphalt gets added to the streets, the distance between the road surface and the footpaths steadily diminishes. Once the torrential showers of rainy season arrive, this means ever more flooding that dampens the ankles of residents. 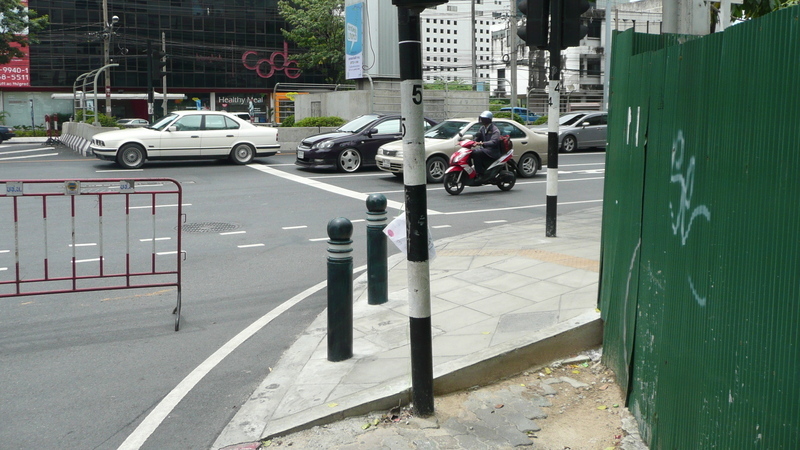 The Bangkok Metropolitan Authority, in all their wisdom, is addressing this issue by raising the sidewalks. 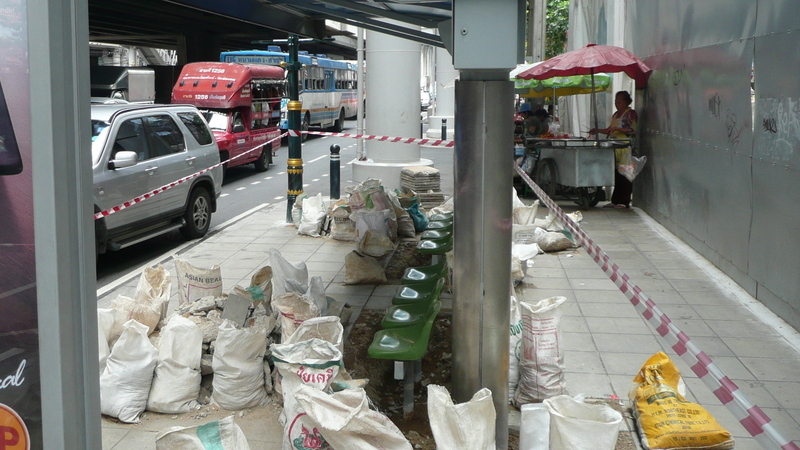 In the case of Sathorn Road, a main business artery, sidewalks have increased by about a foot (30 cm). Here you see a raised section abutting a section of the footpath that is at the old height. The new section actually gains additional elevation behind the fence. The green metal poles are a new addition, too, designed to prevent motorized vehicles (except motorcycles, I suppose) from driving on the footpaths. They are still wide enough to allow street vendors’ carts to enter, though. The problem is – and you can probably anticipate this as it is common to metropolitan governments the world over – the construction crew responsible for raising the footpaths isn’t responsible for raising any of the objects along the footpaths such as street lamps, signs and bus stops. The net effect is that bus stop seats that used to be at a comfortable sitting height are now at a squat. Sure enough, another contractor is following the first one, tearing up the new pavers (which, a first for Krungthep, are actually on a cement base rather than just floating on a layer of sand and dirt), then digging out and raising the benches, shelters, signs, etc. This entry was posted in Uncategorized and tagged Bangkok, Footpaths, infrastructure, Krungthep, Sidewalks, Thailand by christao408. Bookmark the permalink. Inefficiency is mostly a key part of any public work here in the Asian countries (except China and Singapore maybe)! I would just past a law to allow only short people into the bus shelters. No need to raise the seats… hahahaha. I had to laugh about the squat seats and I totally agree with Elusive, lol. Yeah, this seems to be public works and government inefficiency at its finest. It’s amazing and definitely a little sad how many planning projects go this way. I seriously do not think government short-sightedness and waste are limited to the Asian countries. We here in the good old US of A have our share of weird and unexplainable public works projects. Our freeways are proof of that. Good Grief!!!! I am still laughing! That vieo is a hoot. You made a good point regarding the pavers floating on layers of sand and dirt. My friend’s wife broke her heels while walking these streets because of the loose pavers. Pedestrians beware! @CurryPuffy – It amazes me that more people don’t break ankles! @stebow – That’s true, it is a global phenomenon. ..an intentional way to spread a little largess… that’s so typical Bangkok! Squat seats?? Funny vision in my head. Elusivewords always comes up with such funny ideas. yes, they would do that. A friend of mine, Dr. Geoff Fernie, is doing some very interesting work around pedestrian crossings. See here. @ZSA_MD – Yes, Matt is clever that way. @AppsScraps – Brent, I scanned the 64 pages and did not immediately catch an article about crosswalks. Where should I be looking? @beautyandthebum – And so many other places, too, I’m afraid!